Education pieces from us and our readers. Walker has walked away from Wisconsin's long commitment to strong public schools. MADISON - Democrats know that a strong public education is the key to opening the doors of opportunity for millions of Wisconsinites. Unfortunately, under Gov. Scott Walker, Wisconsin has walked away from its commitment to strong public schools by making historic cuts to public education over the last six years all while shoveling millions to fund unaccountable private schools. This weekend, an investigation by the Associated Press revealed motivations for the Governor's destructive policy choices. 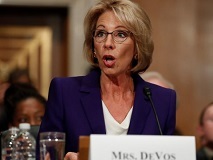 After examining political contributions over a 10-year period by U.S. Education Secretary Betsy DeVos and nearly 50 other individuals and married couples who gave large sums to advance unaccountable private schools funding over public school funding, nearly $1.5 million flooded Wisconsin since 2007. More than a third of the haul went to Gov. Scott Walker. According to the Associated Press, Gov. Walker received $512,000 since his first run for governor in 2010. The report also found that the DeVos family donated $731,250 to politicians and political groups in Wisconsin - the third highest total for all states. "Democrats believe that Wisconsinites should determine how their schools are funded - not out-of-state corporate tycoons looking to line their own pockets," Democratic Party of Wisconsin spokesman Brandon Weathersby said on Monday. "For six years, Gov. 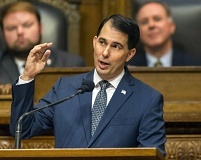 Walker has come up with excuse after excuse for making historic cuts to public education, but the latest report from the Associated Press is further evidence that his education policy choices were actually dictated by millionaires and billionaires outside of Wisconsin. If we want to ensure that every child has the chance to go to a great school, with great teachers, and with the programs and tools they need to succeed we need Democratic leadership that will ensure that Wisconsinites determine the future of our education system." Read the report from the Associated Press here. Then Superintendent Lowell Holtz composed emails during the work day at the Whitnall School District to solicit campaign contributions and support from high level Republican political donors. MADISON - News reports broke Saturday that while he was Superintendent of Whitnall School District, Lowell Holtz, used his tax-payer funded work day and school resources to compose emails to benefit his campaign. Dated May 25th, 2016, the email includes references to American Majority, Milwaukee Republican Caucus, Tommy Thompson, Governor Walker, Robin Vos, Scott Fitzgerald and Don Pridemore. The last two weeks have uncovered a lot about Lowell Holtz. First - he has completely reversed his position on allowing school districts to adopt their own curriculum standards. Followed by Holtz plotting with unnamed business leaders to seize control of Wisconsin’s 5 largest school districts, and pay himself a $150,000 salary in the process. Now we learn that while he was superintendent, Holtz was using tax-payer funded school resources and time to solicit campaign contributions and support from high level Republican donors. It is clear that voters can’t trust Lowell Holtz to provide them with the full story. I’m almost afraid to ask: what will we find out next? Laura supports teacher retention, amplifying the important link between our local economy and good public schools, and changing the negative narrative we hear so often with respect to our schools and the teachers and staff who work in them. GREEN BAY, WI - Our family is proud to have lived and worked in Green Bay for almost 18 years. For many of those years I focused on raising our two daughters, but I have also served my community as a board member of our neighborhood association, the Brown County Historical Society, and the Northeastern Wisconsin Dance Organization (NEWDO). I am also proud to have been appointed by the governor to serve on the Wisconsin Historical Records Advisory Board. I am a graduate of New London Senior High and UW-Whitewater. As each year passes, I become more aware of the role those public schools played in shaping who I am today. I believe that supporting strong public schools and the dedicated teachers, administrators and support staff who lead them is essential to the well-being of our families, our communities and our economy. Our daughters are proud graduates of Aldo Leopold Community School and Green Bay East (Go Red Devils!). We are thankful for the excellent education and guidance they received in the Green Bay Area Public School District. I look forward to the opportunity to give back to our community and contribute to its long tradition of strong public education by serving as a Trustee on the Green Bay School Board. Election Day is April 4, and I hope I can count on your support. I invite you to share your thoughts and ideas with me. Find out more about Laura on FaceBook at Laura McCoy for Green Bay School Board. Vote for Evers shows Wisconsinites want a strong public education system based on excellent educators, motivated parents, and active community leaders all working together to provide our children with the preparation they need to be successful in life. MADISON - For decades, a strong public education system opened doors of opportunity for millions of Wisconsinites. And last night, the voters came out in support of our public schools and the 860,000 public school children all across our state. "The message from the voters was clear last night," Democratic Party of Wisconsin spokesman Brandon Weathersby said on Wednesday. "Wisconsinites want a strong public education system based on excellent educators, motivated parents, and active community leaders all working together to provide our children with the preparation they need to be successful in life." 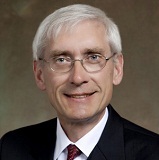 There is only one candidate in race truly committed to public schools, State Superintendent Tony Evers who received 69 percent of the vote in Tuesday's primary. His opponent, Lowell Holtz, has spent his campaign flip-flopping on education issues and following the lead of the pro-unaccountable private voucher school advocates who promise to pour money into his campaign. "Holtz publicly endorsed Secretary of Education, Betsy DeVos and her record of supporting privatizing public schools across the country," said Weathersby. "Holtz also proposed and discussed a House of Cards-style election bribe in exchange for the support of his conservative rival in during the primary. Making Holtz not only an enemy of public education but a self-dealing opportunist who will put himself before Wisconsin's schoolchildren." State Superintendent candidates met in December to discuss combining campaign efforts. Five school districts, including Green Bay, serve 165,000 public school kids in Wisconsin. MADISON - On February 15, 2017 news reports broke that State Superintendent candidates John Humphries and Lowell Holtz met in December of 2016 to discuss the possibility of combining their campaign efforts in exchange for well compensated positions within the Department of Public Instruction following the spring election. While the who said what details of those discussions appear to be in dispute between the two men, both provided documentation of their encounter to the Wisconsin State Journal that outlined the complete takeover of Wisconsin's 5 largest school districts. Unilateral discretion to change the school boards when"deemed necessary"
These five school districts combined serve 165,000 public school kids in Wisconsin. All five have elected school boards, chosen by Wisconsin voters, who are responsible for overseeing the districts. "Voters across Wisconsin will head to the polls on Tuesday for the spring primary. They deserve to know beforehand the details of Humphries and Holtz's plot to takeover our five largest school districts. 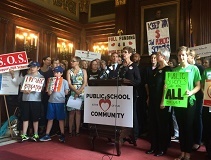 "This plan, if implemented, will impact almost 20 percent of the public school kids in Wisconsin, and would strip away parents and community member's rights to weigh in on their local districts. "This is a massive power grab. It isn't a conversation that can be simply brushed aside. This is a proposal for a heavy handed, top-down approach struck through a backroom deal between a few unnamed business leaders and two politicians looking out for their own financial interests. Wisconsinites deserve better. Our kids deserve better." Walker Rural School Plan "A Drop In The Bucket"